in reading the article below do be minded that 2017 is the Centenary of The Bolshevic Revolution and naturally Vladimir Putin and some of his cronies may well wish to act in a manner that marks the importance of their presence! This factor is likely to influence much of Putin’s posturing and interference on the world stage however it is unlikely that he will be foolish enough to enter into direct confrontation with any Western Nation as he will be all too well aware of their various interlocked alliances. We are far more likely to be plunged into the very confrontation we would wish to avoid by the crass behaviour of the unelected apparatchiks of the EU – as was made manifest by the dangerous interference of the EU in the Ukraine where they crassly overlooked two very major considerations. FIRSTLY: The EU overlooked the fact that the Crimea was titularly under the control of the Ukraine, as a result of Nikita Kruschev’s rewarding the Ukraine for its loyalty – when very clearly Crimea was a crucially important Russian Federation Naval base and also a USSR now Russian holiday region! SECONDLY: The EU totally overlooked the fact that Kiev is not only the capital of the Ukraine but also has a far greater influence over Russia and the old USSR territories being the centre of the Russian Orthodox Church! The soldiers were fast asleep when the “little green men” appeared through a clearing in the forest, wearing the unmarked uniforms favoured by Russia’s Spetsnaz special forces. As silent as the falling snow, they advanced on the abandoned, windowless housing blocks where 3 Section of the 17th Latvian Air Defence Battalion were curled up asleep on the concrete floor. The darkness was total in the ghost town of Skrunda-1, a former Soviet military base and radar station. But not for long. An eye-watering smokescreen accompanied by a series of thunder flashes, flares and gunfire rent the night asunder. In Bunker 7, a librarian, a mother of two and a garage mechanic — along with a mixed crew of 50 others — scrambled for their old Ak4 Swedish assault rifles. Stumbling from Nato-issue sleeping bags and bent double, they zigzagged to the windows to return fire. It was -6C and Private Ivo Mednis, a burly man in his late thirties, wiped the snow from his spectacles and beard. Like many others, he has signed up to the National Guard to defend Latvia against the attack from Russia that the whole of his homeland is bracing itself for. There are queues of young and not so young (the age limit is 55) Latvians clamouring to join the 11,000 who make up the small nation’s three brigades of civilian soldiers. Members of the National Guard train with regular forces and sign up for a statutory five years, and are obliged to bear arms even after that; 3 Section is based in Riga, the Latvian capital, as are the Cyber Defence Unit, the Veterans’ Union and the Orchestra and Choir of the Guard. However, singing was a long way from anyone’s mind as the unidentified enemy attempted to storm the bunker. It was hard to tell what was going on through the smoke and din, but it quickly transpired that the 17th Air Defence Battalion had responded quickly enough to capture or kill the advancing enemy, and, just as suddenly as the gunfire had started 30 minutes earlier, it stopped. This military action was only an exercise, but its combatants know that the real thing is all too likely. War is being predicted this year. Linas Linkevicius, the foreign minister of neighbouring Lithuania, says he thinks the Russian president, Vladimir Putin, may strike into the Baltic states even before Donald Trump is inaugurated as US president on January 20, to test the resolve of the Nato alliance. Under the Nato pact, an attack on one member of the alliance is deemed an attack on all — so if the Russians were to invade Latvia, a Nato member, Britain, America, France and the other Nato nations would be expected to leap to Latvia’s defence. However, because Trump on the campaign trail was a little wobbly on the extent of his commitment to Nato, suggesting, “Nato as a concept is good, but not as good as it was when it first evolved” — primarily because “it’s costing us too much money” (a jibe at the European countries that don’t devote at least 2% of GDP to defence) — the North Atlantic Treaty Organisation is certainly not quite what it was. And this is not just Baltic paranoia: the British general and former Nato boss Sir Richard Shirreff makes a similarly grave prediction about the likelihood of a Russian invasion of the Baltics in his book, 2017: War with Russia. Certainly, tensions in this part of the world are running high. It was the Latvian secretary of state for defence, Janis Garisons, who gave us permission to come on this exercise when we met him the week before it took place. He revealed that the Latvian National Guard is on red alert and that many soldiers keep their weapons at home in readiness for the attack they fear is imminent. After the guard had foiled the “little green men” on this exercise, hot drinks were served from an ancient field boiler as we stood around a blazing bonfire. The “Russian Spetsnaz” assailants this time were, in fact, a bunch of hardened regular Latvian NCOs, who, afterwards, debriefed the volunteers as they jockeyed for position around the burning embers. But everyone here knows only too well that next time the Russians really could be coming. Private Mednis runs an internet business in Riga; you could be forgiven for wondering why he’d give up his weekend to get shot at in a blizzard. “Why do we do this? The answer is simple. We want to show the enemy that we are prepared to fight,” he says. “They feel they may soon have to fight for their lives and for their country. Independence means a lot to them, and more and more are volunteering,” says fellow First Sergeant Edgars Fogels. Their attitude is generally “better”, he says, than that of the regular troops. Under the gunmetal grey of the Baltic sky, the troops were inspected at 0900, after the exercise was over. Snow was again falling and the old four-ton transport lorries spluttered diesel fumes into the morning air as they awaited their cargo of volunteers. Skrunda-1 was built in the 1960s and housed two giant Dnepr radars, which provided the Soviet early-warning system for incoming intercontinental ballistic missiles. Three miles north of the small town of Skrunda, it was also a spy station and home to thousands of troops. All that is left are the concrete skeletons of Soviet army blocks, ideal for training. 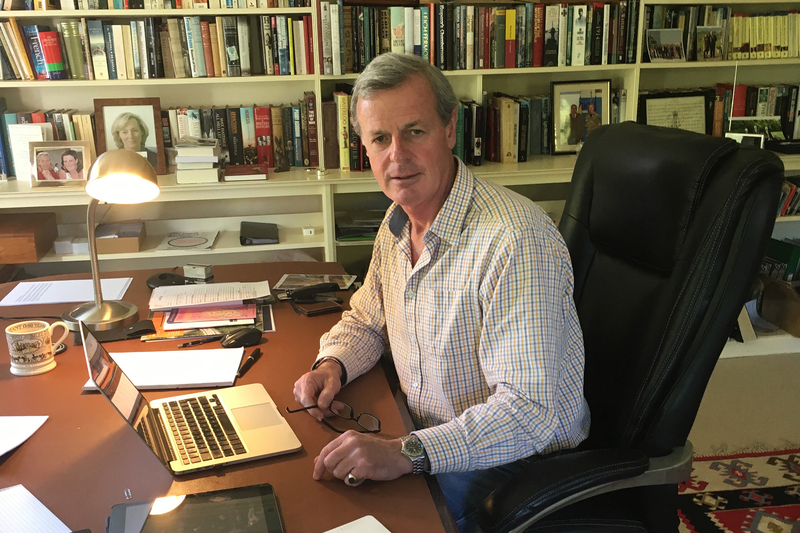 IN RURAL Hampshire, England, at the farmhouse of Sir Richard Shirreff, Nato’s former Deputy Supreme Allied Commander Europe, coffee is served in a huge book-lined study. It was here that he penned 2017: War with Russia, a Sunday Times bestseller. 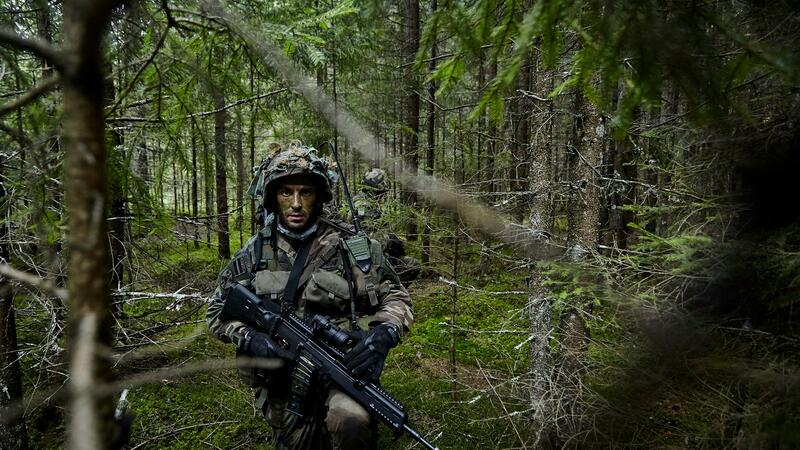 Published last year, it’s an apocalyptic warning dressed up as a techno-thriller: there will be war this year unless we react to the clear and present danger posed by Russia in the Baltic states. A previous guest at his home in 2012 — this time his Nato abode in Belgium — was General Valery Gerasimov, chief of the general staff of the Russian armed forces, and architect of their brand of “hybrid warfare” — a broad range of hostile actions of which military force is just one. But in 2012 things were more relaxed, and Nato and Russia were working towards a strategic partnership. Latvia is the obvious target because its population has the highest proportion of Russians in the region (27%), quickly to be followed by Lithuania and Estonia, and Putin’s forces can launch an airborne brigade into Riga in 50 minutes from their base in Pskov, near the Estonian-Latvian border. “Once the Russians were in control there, it would be game over,” says Shirreff. In Latvia there are reminders everywhere of the former Soviet occupation, the half-century from 1940 until the hand-holding ceremony in 1991 that marked the beginning of the end of communist rule from Moscow (with the exception of Nazi occupation from 1941 to 1944). Whole swathes of the country were off limits during those times. Much of Latvia’s Sweden-facing west coast, from Liepaja to Kolka, was given over to military activity because of its strategic westerly position. Liepaja is where the Soviet Atlantic submarine fleet was stationed — the Karosta naval base and army barracks still occupies a third of the town. At the dark and bone-chilling military prison, former guards lead tours; you can spend the night, if you wish, for €17, sleeping on a wooden board and being woken at regular intervals for verbal abuse. It is surrounded by mass graves of deserters shot by the Nazis. Near Ventspils, in another military ghost town, there is the International Radio Astronomy Centre. This is a newly restored, 600-ton, 32-metre dish mounted on a 25-metre concrete base that was used to eavesdrop on the West. Further north, the beautiful but desolate Kolka peninsula was out of bounds throughout the Soviet era to all but the handful of Livonian-Finnic peasants who lived and farmed there. Tracts of forest and swamp stretch for hundreds of miles and still occasionally belch up Soviet and Nazi tanks that strayed from the ancient bridleways. Old watchtowers keep guard over the coast between Ventspils and Kolka, and from the top of the one at Cape Kolka you can see the old searchlight towers that raked the sands after the 8pm curfew. The road from Kolka to Riga takes you through Jurmala, in the past a playground for rich Soviets just as it is now a playground for Putin’s plutocrats. It is Gstaad meets Cannes, with a touch of Martha’s Vineyard thrown in, on 20 miles of white sand. A stretch of interstate-style highway connects it to the airport, where private Russian jets are parked, then the road continues to the arching suspension bridge that leads to the walls of Riga Castle and the old town. At the Innocent Café in Riga’s Blaumana Street, the owner, Martins Stakis, a Latvian TV celebrity, businessman and restaurateur, has done much to promote the cause of the National Guard. Stakis is a leading member of the Student Battalion in Riga, set up in 1914 to combat the German advance. As well as being host of Roots in the Sky, an Andrew Marr-style Sunday-morning current affairs programme on the main LTV1 channel, he is a trainee military instructor. He is correct about the propaganda war, which grindingly attempts to foment dissent. The Baltic TV and radio waves are saturated with Kremlin-controlled programmes and news channels that the local ethnic Russian population tune into. Amendments to the national security law were introduced this year stipulating that the armed forces should take instant military action in the event of invasion, no matter what the government says. This is to pre-empt a government takeover immediately prior to military escalation. There is a precedent here: Latvia’s rulers capitulated overnight to the Russians in 1940. 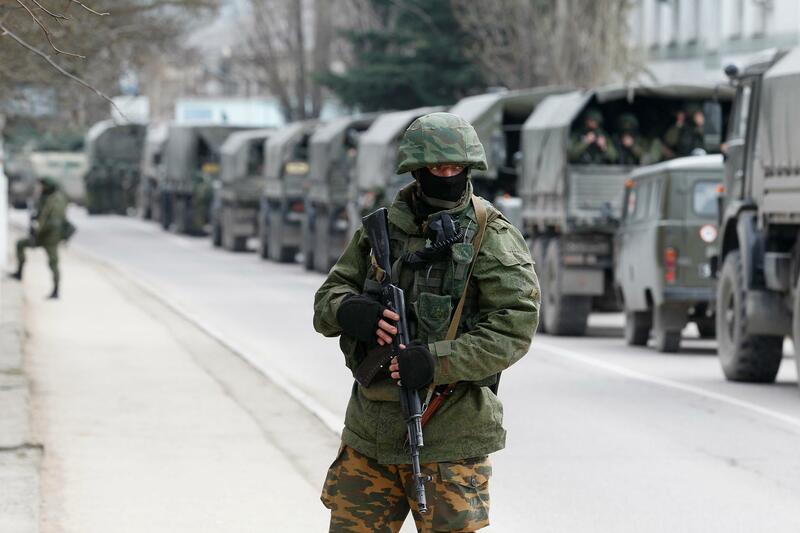 Otherwise known as the Gerasimov Doctrine, hybrid warfare blurs the boundaries between war and peace, meaning that mobilisation effectively begins long before any declaration of war. It incites fifth columns and introduces computer malware to do the spying. When the Snake virus struck in Ukraine, it allowed Moscow access deep inside the Kiev government’s files. In the case of Latvia, increasing cyber attacks have coincided with Russian exercises involving up to 40,000 troops near its borders. Recent exercises have ended with a simulated nuclear strike, in tune with Russia’s new “first-use” policy — the idea that if Russia were faced with a large-scale conventional attack, it might respond with a limited nuclear strike. Targets have included Warsaw, Berlin, Copenhagen and Stockholm, which all fall within range of the Kaliningrad-based Iskander tactical nuclear weapons. Paradoxically, this strategy is known as “nuclear de-escalation” — that is, making the threat of a nuclear response so credible that Nato simply backs off. 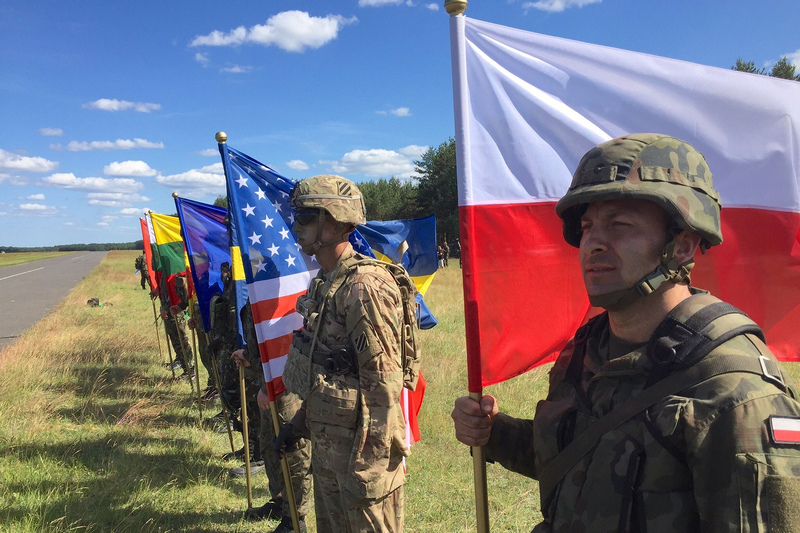 Last year, Nato held counter exercises, the biggest of which was the Anakonda war game in Poland in June, in which 31,000 troops from 24 countries, including America, Poland and the UK, took part. “All the snap exercises the Russians are undertaking and the movement of troops mean you cannot draw any other conclusion than that they are planning to capture the Baltic states,” says the author and analyst Dr Julian Lindley-French, whose book The New Geopolitics of Terror: Demons and Dragons comes out early this year. “The more likely threat is not war with Russia, but limited war with Russia, whereby they simply seal the Suwalki Gap on one of the snap exercises. They would have the manpower and Nato would be unable to respond,” Lindley-French told The Sunday Times from the annual Riga Conference, an event staged since 2006 — two years after Latvia joined Nato. The Suwalki Gap is the 40-mile border between Lithuania and Poland (see map, previous page), a strategic choke point between the Russian exclave of Kaliningrad in the west and Belarus in the east. It is the only exit to Europe for the Baltic states, the rest of their landmass being bound by Russia, its ally Belarus and the sea. Putin’s gamble is that, in the face of direct nuclear threat, Nato would be reluctant to sacrifice European cities and in so doing would bring about its own demise. “Trump’s election seems to make this scenario even more likely, since he has denigrated Nato and questions the transatlantic link,” says Lindley-French. Some 50% of the population of Riga are native Russian speakers, including its first ethnic Russian mayor since independence. Some 350,000 ethnic Russians and former Soviet citizens are still “non-citizens” in the Baltics, denied the vote, passports and membership of the EU. In Latvia’s second city of Daugavpils, about 80% of residents are Russian speakers. Sanctions and counter-sanctions have created financial misery there. In the Lithuanian capital of Vilnius, the Ministry of National Defence is keeping close tabs on propaganda and hybrid threats from its intelligence-gathering quarters in the rambling medieval buildings of the capital’s handsome Old Town. The strategic communications department of the Lithuanian Armed Forces (Stratcom) monitors the open propaganda pouring into the Baltics from radio and TV. “We live in information wartime. It’s been going on since 2000, but is intensifying. Russian media is state sponsored and this war goes on round the clock — it’s the war that starts before the fight, and if we lose this war, we will have to fight with guns as well,” says Captain Tomas Tauginas. “We must inform the population about the threat, seek its support, enforce patriotic feelings so as to decrease the grip of Russian propaganda,” adds his colleague, Master Sergeant Tomas Ceponis. The Lithuanian government is taking the situation so seriously that it has just issued its third survival guide to the public since 2014, an illustrated 75-page pamphlet with advice on how to evacuate, how to recognise friendly military and how to deal with chemical or nuclear attack. In Estonia, 1,000 survival capsules have been planted in the forest in readiness for guerrilla war, with supplies for two years. In the skies above Lithuania, Nato planes were scrambled well over 100 times last year in response to Russian activity in its airspace. This includes flying over neutral sky without permission and flying without transponder identification, posing a hazard to civilian flights. In 2015 there were 160 emergency deployments in response to Russian aerial aggression, 140 in 2014 and only 47 in 2013. A name that is never far from the lips of those gathered for the Riga Conference is that of Vladimir Zhirinovsky, the clown and controversialist at the court of Putin. Like any jester, he is closer to the beating heart of the king than any courtier. He is the one paraded on TV who cracks the jokes, speaks the language of the people and prophesies what will happen. As he did in Georgia, Crimea and Eastern Ukraine, with chilling accuracy. In reality, he is a razor-sharp former KGB colonel, leader of the Liberal Democratic Party of Russia and former deputy chairman of the Duma. He is one of Putin’s right-hand men, with a doctorate in political philosophy. “The Baltic states must be occupied or destroyed. The Russian flag will be flying over Riga, Vilnius and Tallinn,” he has said. He also said on the Rossiya-24 network that pre-emptive strikes should be launched at the Baltics and Poland, adding that Russia “cannot allow” peripheral nations to have missile defence systems and air forces within striking distance of Moscow. To him, they exist only as part of the Motherland. Putin is a curious psychological case, according to the renowned academic psychologist Vaira Vike-Freiberga, who also happens to be Latvia’s former president and perhaps the Baltics’ most distinguished political figure. 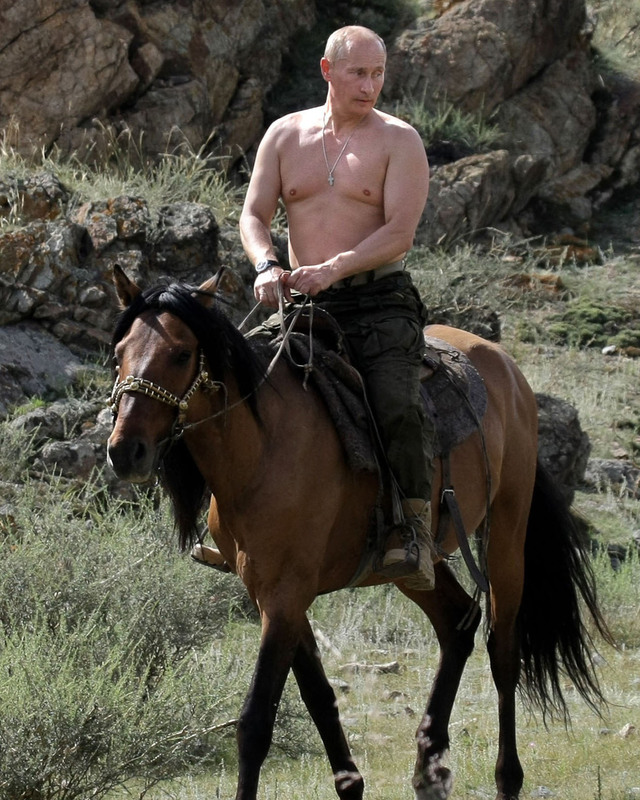 “Putin is a judo black belt who uses the momentum of his opponent to his own advantage. He’s also the alpha male’s alpha male, who goes tiger hunting in Siberia and walks bare-chested through mosquito-infested swamps. Then he parades vast armies on our borders and complains when we react to these threats, as if we were about to invade Russia!” she told The Sunday Times. “He was forged in the Soviet era and is a product of the KGB. The spread of Putinism has been hugely successful, even down to turning Aleppo in Syria into a ‘personal’ crusade against Isis, which, sadly, people are believing. This is a highly complex situation that he is turning to his advantage. Nato needs to stand up firmly to this bully and be seen to be serious and committed to its principles. That is the only way to avoid increasingly serious confrontations. IN RIGA’S Moscow District, the insalubrious former Jewish quarter, members of a private fighting club work out in an old factory. Tevijas Sargi, which translates as Guards of the Fatherland, is an ultra-nationalist volunteers group who have set up an alternative National Guard to fight in the streets of Riga in the event of occupation. 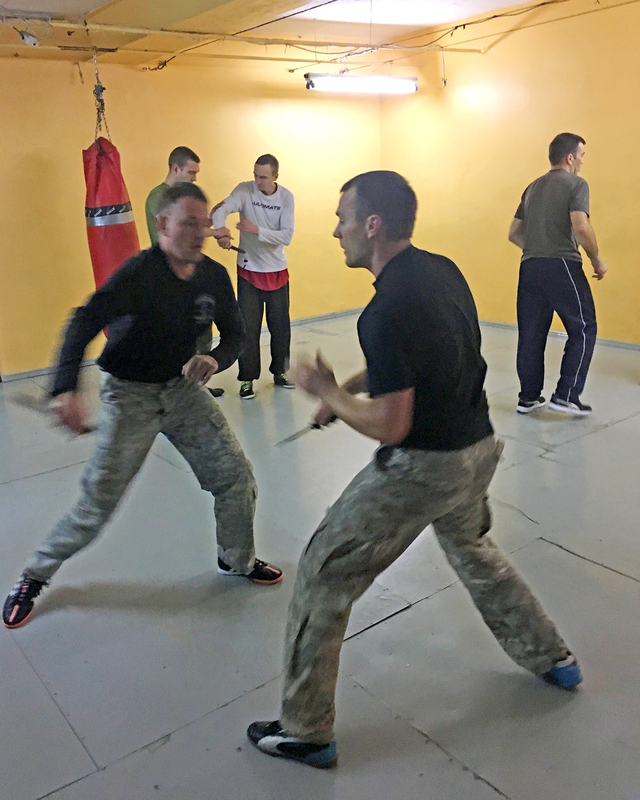 Under the tutelage of 36-year-old Janis Sils, who recently returned from Ukraine, where he taught unarmed combat to anti-Russian freedom fighters in Donbas, they learn how to handle themselves. Sils runs an online military apparel business, has a master’s in political science from the University of Latvia and is reliant upon donations from his 1,000-strong membership. Tom, a gardener who works in the south of France, turns up with a wad of cash, which he donates. “I’ll come back to fight,” he says. Renars is a 31-year-old construction engineer whose fight partner is Ivo, a 42-year-old municipal auditor. The pair attack each other with knives, baseball bats and a lot of gusto, but are at a high enough level to avoid injury. “We are fighters, not victims,” says Sils, whose unblinking blue eyes leave little room for doubt. “The National Guard is fine, but they don’t do self-defence.” The gym smells of old and new sweat. There are daggers, punchbags, fake assault rifles and a clutter of machetes. “We get people from all backgrounds.” There’s a young woman who doesn’t wish to speak and a bearded fellow who would be judged unfit for action even by Britain’s Pudding Club, but the rest seem in reasonable nick. It is Armistice Day, also known here as Bear Slayer Day, celebrating the legend of a Latvian hero, Lacplesis, who pulled bears apart with his hands. Once again the snow falls as candles are lit along the wall by the River Daugava, outside the presidential palace. It falls on the pushchair of Uldis Judinski’s six-month-old daughter, gathering on the hood. Uldis is with his wife, Inga, and second daughter, aged three.